The News Agency of Nigeria (NAN) correspondent who visited the scene of the crash gathered that the tanker which was Enugu-bound ran into the bus loaded with food items. The bus was trying to join the Expressway from the junction leading to Old road. The accident occurred at about 1:10 a.m. on Wednesday. 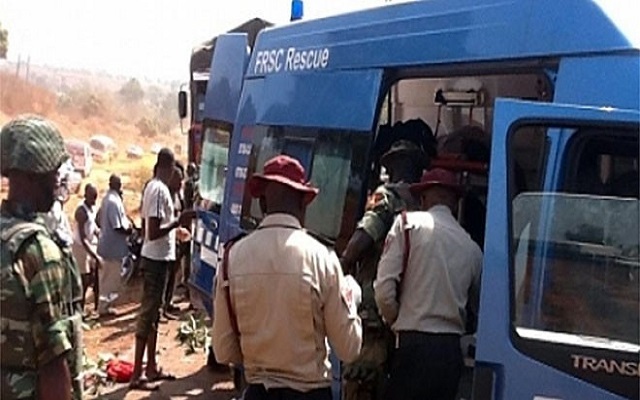 A combined team of the Federal Road Safety Corps (FRSC), Nigeria Police Force, Nigeria Security and Civil Defence Corps (NSCDC) and Fire Service personnel was seen cordoning off the area, diverting traffic and ensuring that fire did not inflame again. Mr Andrew Kumapayi, Sector Commander of the FRSC told NAN that his team arrived the crash scene 10 minutes after the incident was reported for rescue. Kumapayi said four persons were involved including three males and one female. He blamed the crash on speed violation and loss of control. “About 1:15 a.m. this morning, we got a report of a crash involving a petrol tanker marked YLA 170 XM with product and a Mercedes Benz bus with Reg. No: BKL 80 XA at Immigration Junction, Agu Awka. “Four persons were involved; two died on the spot and two including a man and a woman have been taken to Chukwuemeka Ojukwu University Teaching Hospital for medical attention,’’ he said. Kumapayi called on drivers and owners of articulated vehicles plying the Anambra route to maintain their vehicles and observe traffic rules and regulations at all times. He warned that his command would not fold its arms and watch motorists waste the lives and property of innocent citizens on the highway NAN reports that the sector commander alongside other stakeholders in traffic management held a town hall meeting with truck drivers in Onitsha on Monday on ways to curb carnage. The command had decided to commence strict enforcement of articulated vehicle driver’s compliance with rules in the state from April.